Having interviewed Microsoft UK’s CMO twice previously for the csuite podcast, we were invited to record content at Microsoft Future Decoded, which is visited by around 20,000 decision-makers, developers and IT professionals. The aim was to record as many interviews as possible with event speakers to widen its reach, giving those who couldn’t attend a taster of what was hot on the agenda, as well as an opportunity for those who were there to hear more. 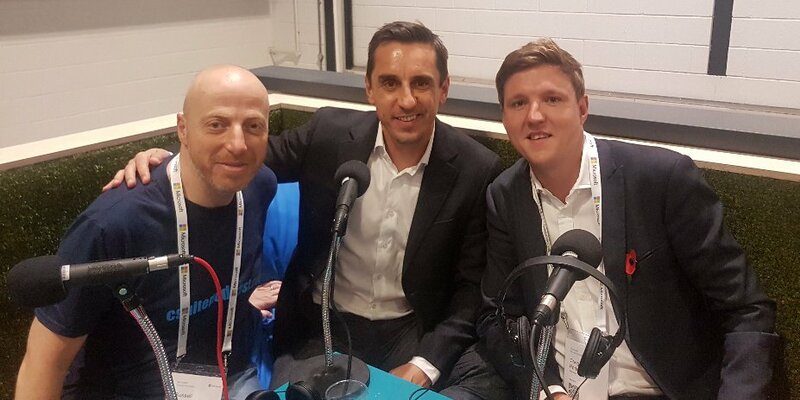 We interviewed 16 guests, including Clare Barclay, Microsoft’s COO and Gary Neville, ex-Manchester United footballer and Founder of University Academy 92, producing almost 2.5hrs of content, split into three podcasts on the topics of ‘Driving Cultural Transformation’, ‘Technology for Good’ and ‘Technology and Innovation Trends’. What does Microsoft UK think of Audere? What did Audere achieve for Microsoft UK? Sign off for the project was only given at the end of September and so we only had one month to work with Microsoft’s Digital Destination & Storytelling Lead to coordinate the in-house teams to set up and prepare for each interview, which involved background research and speaking with the guests in advance to structure the content. The podcasts were then made available to download as soon as possible with all content being slowly shared across social media. No specific listener number targets were set, but rather the fact that we were creating content to continue the dialogue and engagement with attendees, post event, giving a taster of what was being discussed to those people who were unable to attend. The interviews also provided extra value to the Microsoft speakers and their guests, enabling them to share their stories beyond the walls of ExCeL. Coordination of the interviews became quite a challenge as interest about the podcasts started to spread through Microsoft, with calls and requests coming in from various teams in the UK as well as in Seattle, US, where key speakers were being flown over for the event. The only challenge was in not being able to fulfil every request from the Microsoft team! However, now we know how popular the format has proven to be, this can easily be overcome next year by expanding the production team and having an additional interviewer and audio engineer on site. Other than one interview with Microsoft UK’s COO, all the interviews were recorded in the main expo hall as this provided a real busy background atmosphere. The content was then turned around within 24 hours, meaning it could be shared whilst the event was still very fresh in people’s minds. We produced two edits of each of the podcasts. One version was to be used on the csuite podcast channel and a second version, which included soundbites in between each of the interviews from exhibitors, was used on the Microsoft Future Decoded website. The content was then uploaded to Soundcloud, distributed to other podcast platforms such as iTunes, and shared through social media including Twitter, LinkedIn and Facebook, with show notes written up for each of the interviews and shared through social media, providing a second wave of PR around the content.